Congress president Rahul Gandhi said his promise of minimum income would mean no poor person would go hungry if his party wins the Lok Sabha elections. 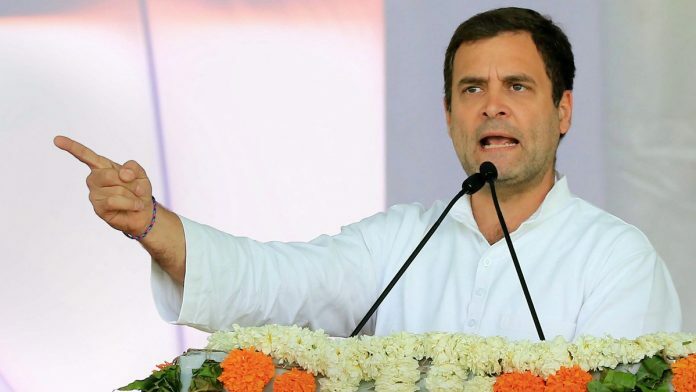 Raipur: Congress president Rahul Gandhi announced Monday that his party would ensure minimum income guarantee for every poor in the country if it returns to power after the Lok Sabha polls due in April-May. He accused Prime Minister Narendra Modi and the ruling BJP of trying to create two Indias — “one of the Rafale scam, Anil Ambani, Nirav Modi, Vijay Mallya, Mehul Choksi and the other of the poor farmers”. Gandhi made the remarks at the ‘Kisaan Abhaar Sammelan’ held here to express gratitude to Chhattisgarh’s people, particularly farmers, for voting the party to power in the state after a gap of 15 years. “The Congress has decided to take a historic decision… The Congress-led government is going to give minimum income guarantee. This means, each poor person in India will have minimum income. This means there will be no hungry, poor people in India,” Gandhi said. He also distributed loan waiver certificates to some of the beneficiary farmers during the function. Chhattisgarh Chief Minister Bhupesh Baghel and senior Congress leader P L Punia were among those present at the event. The Congress had posted a massive victory in last year’s state Assembly polls, winning 68 of the total 90 seats. Chunaav ka mausam hai, aise vaade kiye jaate hain. When the new government is installed – to use one’s poetic licence – Dr Rajan, seated in his office in North Block – reportedly the size of a football field -, will confront the correct numbers and true state of the economy. He will sweat, not because it is May. One of many things he will tell his Prime Minister will be, Sir, we have $ 6 to share out to each Indian each morning. Chip away what the tycoons, the upper classes, the middle class, we ourselves, preempt. Tell me what our priorities should be. Stunted children, health and education in disrepair. Money falling short for polio vaccine, wages to labourers on Nrega sites. The expensive toys our military covets. Internal security. Upgradation of infrastructure. Agriculture. Urbanisation. Thawing out manufacturing and exports from a long winter of hibernation. 2. Whoever forms the next government will confront a 1991 moment. May the next five years be far more productive. If there is a plan then its okay. Without plan one keep talking like how Modi did last time. Pandrah Lakh har ke account mein. Sure then its wrong. I am sure it will be in election manifesto. T Chandrashekar Rao the CM on Telangana did what he promised. He won with clean sweep. 89 Seats plus support of MIM 7 out of 119. Arvind Kejriwal will win too because he had done a great work in Delhi. At least 45 to 50 seats. Not like Nitesh Kumar always changes the collation and survive. He will be thrown out and his political career will be over once the BJP is gone from Center. Since its a hung assembly and BJP is going to lose more seats I would say who ever forms the government will go after the people who behaved funny. Of them is JDU in Bihar, Goa, Manipur.